If Prince Harry and Meghan Markle’s engagement has inspired you and your beloved to get hitched, you should consider a lab-grown diamond for the engagement ring. Not only are they practically identical to the kind formed underground, but they are cheaper by about 30%. The largest selling grown diamond brand in the United States, Pure Grown Diamonds, has just launched its first ever bridal collection. The ring shown above is a double halo engagement ring with a matching band. 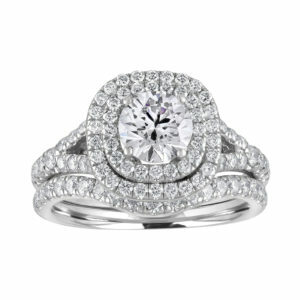 Beyond just the stunning gleam, also consider the diamond’s source. According to PGD, “these diamonds are sustainably grown above earth with fair production practices, they are ethical in the truest sense and leave a significantly smaller carbon footprint when compared to mined diamonds.” So now, you can have your own princess fantasy while also being environmentally and socially conscious. Just say, I do.